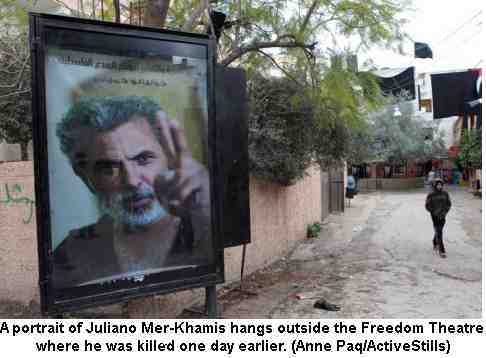 The Jewish Palestinian film director Juliano Mer Khamis was shot dead by a masked gunman in Jenin, outside his beloved Freedom Theatre. 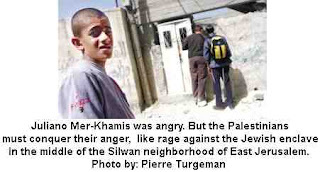 The son of Arna Mer Khamis, a noted Israeli anti-Zionist, Juliano was both passionate and angry in support of the Palestinian cause. Who murdered him is cause for speculation but one can assume that the Israeli government and the Palestinian Authority together bear much responsibility. Below there is a tribute by PACBI, the Palestinian Campaign for the Academic and Cultural Boycott of Israel and an appreciation and interview by Maryam Monalisa Gharavi in Electronic Intifada, a lovely article by Amira Hass and another reminiscence by Adam Keller of Gush Shalom. Let us make sure that this brave and honourable man is not forgotten and that the evil and cowardly deeds of the gunman who murdered him are not allowed to silence his message. A strong and thoughtful supporter of the cultural and academic boycott of Israel, Juliano also worked to construct hope for all Palestinians. From the devastated streets of the Jenin refugee camp, he saw Boycott, Divestment and Sanctions (BDS), coupled with other forms of peaceful resistance, as the best hope for exercising Palestinian self determination and realizing the refugees’ aspirations to return to their homes of origin. Juliano’s memory will forever be a part of us and his loss will be mourned by all who struggle for justice and freedom. We shall continue to resist until every town, city and refugee camp in Palestine becomes an open stage for our collective freedom theatre! Actor-director Juliano Mer-Khamis was shot dead by a masked gunman yesterday outside the Freedom Theatre that he co-founded in the Israeli-occupied West Bank city of Jenin in 2006. Born in Nazareth in 1958 to Saliba Khamis, a Palestinian Christian leader of the Israeli Communist Party, and Arna Mer, an Israeli Jewish dramatist, Juliano memorably described himself as "100 percent Palestinian, and 100 percent Jewish." Julian had tried to get his film Arna's Children, which documents his mother's extraordinary transformation from a young settler in 1948 to a drama teacher in the Jenin refugee camp, shown widely. As he discusses in the previously unpublished interview which follows, the film was met with little success the first time. In 2006, he returned as indefatigably as ever, and I met him for the first time at a screening of his film at the Massachusetts Institute of Technology. Though Arna's Children is a documentary, the time markers of the film relegate it closer to a work of fiction. Like other works of art centered on the loss of historic Palestine, most notably the characters who return to their pre-1948 homes in Ghassan Kanafani's Returning to Haifa, Juliano constructed a narrative that is almost impossible to recreate or imagine from any other point of view. In one shot of the film, the sequencing of events binds a shot of Juliano alongside his mother's wrapped body at a hospital with a subsequent shot of the Israeli army bulldozing Arna's Stone Theatre in April 2002. The Stone Theatre was part of Arna's larger cultural project, Care and Learning, founded to allow the children of Jenin -- faced with a crushing and seemingly inescapable military occupation -- a creative outlet for their chronic trauma. The theater was leveled by the Israeli incursion, which Juliano captured on film. The historical date of both these events align almost miraculously, but the montages of destruction -- his mother's corpse and the ruins of the beloved theatre -- are superimposed as mutually ravaged bodies. I interviewed Juliano at Boston's South Station on 4 April 2006 just before he caught a train to the New York screening -- exactly five years before he was killed just outside the Freedom Theatre in Jenin, the locus of his life's most notable work. Juliano's resume as an actor is well-documented, and the details of his biography are sure to be revisited in the aftermath of his murder. It was his cinematic and personal relationship to the refugee camp in Jenin and his complex relationship to Israel that most concerned us in this conversation. Juliano's tone in this interview will be familiar to all who knew him: brutally honest, sardonic and always with an unflinching eye toward the original historic pitfalls of Israel and the Palestinians. He candidly discusses the social engineering of Israeli society, his mother's visionary work in Jenin and his own path from paratrooper to filmmaker/activist. My hope is that it is read as a fragment of discourse alongside the rest of his film and activism work, which together formed the unlikely and uncompromising triumph of art, what artist Paul Chan has called "freedom without force." Maryam Monalist Gharavi: How long was Arna's Children banned in Israel? Juliano Mer-Khamis: It was not really banned. It was silenced. Journalists who wanted to write about the film could not get through the editorial decisions. There were two TV programs made about the film and cancelled at the last moment. We could not find a distributor in Israel for the film or cinemas to screen it. There were certain moments when some critics and journalists used the film as an outlet for their own frustrations, which were imposed on them by censorship and by directing or imposing a very certain discourse on the media by the government. I'm talking about issuing papers, in which were written 'words you can use and cannot use,' 'certain questions you are not allowed to ask' and the way you [are allowed to] ask those questions. If you speak to a Palestinian or to the military you have to change your expressions and the terms you use. So this outlet gave them the courage, I believe, to write, and since then they legitimized the film in Israel and it was screened all over the country. MMG: Arna gave a poignant speech upon accepting the Right Livelihood Award at the Swedish parliament. She said that as Rosh Pina [the Israeli settlement where she lived following the Palestinian Nakba of 1948] grew and developed, the nearby Arab village al-Jauna was "erased from the face of the earth," its Palestinian inhabitants becoming refugees, along with 700,000 others, "through sheer robbery and forced displacement." What do you think stops other Israelis from coming to the same conclusion as your mother? JMK: That's a very interesting question. I'll give you just the framework in which I can analyze this process of history that enabled Israel to confiscate, to settle and to colonize Palestine and not go through the path my mother chose. The reasons are many but the main reason you must understand is that since the Zionist movement was created, it manipulated the history of the Jews, especially the Holocaust period, and used forces around it to create one of the most successful colonies in Palestine. And since then, the victim philosophy or victim theory or victim policy of Jews and Israelis used all means and all aspects in their history since the pogroms -- what they call the persecutions in Russia during the Czar period -- till the announcement of hundreds of suicide warnings coming to Israel. From that to here, we see a policy of fear, a ghetto mentality, a policy that distracts the average Israeli from the truth. Frightened and victimized people can justify any crime they do and it enables them to live with their conscience in a very comfortable way like most of the Israelis. Once you are a victim, it's very easy to create dehumanization and demonization of the other, and this is the success of the first Israeli propaganda in the Zionist movement. MMG: In the scene of your mother's body at the mortuary, you comment somewhat half-heartedly that the only place that would bury her was the kibbutz. What happened after she died? JMK: My mother could not be buried because she refused to be buried in a religious ceremony or funeral. Israel is not a democracy; it's a theocracy. The religion is not separated from the state so all issues concerning the privacy of life -- marriage, burial and many other aspects -- are controlled by the religious authorities, so you cannot be buried in a civilian funeral. The only way to do it is buy a piece of land in some kibbutzim, which refused to sell us a piece of land because of the politics of my mother. It's not a very popular thing in a civilian, non-religious way. And then I had to take the coffin home. And it stayed in my house for three days and I could not find a place to bury her. So I announced in a press conference that she was going to be buried in the garden of my house. There was a big scandal, police came, a lot of TV and media [came], violent warnings were issued against me. There were big demonstrations around the house, till I got a phone call from friends from a kibbutz, Ramot Menashe, who are from the left side of the map, and they came from Argentina. Nice Zionist Israelis, maybe post-Zionist. They offered a piece of land there. And the funny thing is that while we were looking for a place to bury my mother, there were discussions in Jenin to offer me to bring her for burial there, in the shahid's [martyr's] graveyard. They told me there was one Fatah leader, who was humorously saying, "Well, guys, look, it's an honor to have Arna with us here, a great honor, the only thing is maybe in about fifty years' time some Jewish archaeologists will come here and say there are some Jewish bones here and they're going to confiscate the land of Jenin." [Laughs] They do it. Even if they find the Jewish bones of a dog, they take the place. That's the place they do it. Every place they confiscate they find the bones of a Jew and that's how they justify the ownership of the land, by finding bones. MMG: So the logic runs that if you don't want to live next to a Palestinian, why be buried next to one? JMK: Yeah. And almost 50 percent of Israelis think the Arabs inside the '48 [boundary], inside Israel, are a [demographic] and security threat. These are their neighbors, so imagine what kind of relationships, imagine what kind of democracy this is. MMG: I thought one of the most important scenes in the film occurred when Alaa's house, as well as Ashraf's [two of Arna's theatre students in the film], had been destroyed in Jenin, and your mother asks them to express their anger, even to hit her. You end up with this tension, as elsewhere in the film, of a tragicomedy. You find the audience laughing through their teeth. MMG: How would you respond to pro-Zionists watching your film, that despite your mother's "rehabilitation of the Arab mind," the child actors become "terrorists?" JMK: It's a very sick question, not yours, but the pro-Zionist attitude that thinks the problem of violence is the violence of children and not the violence of the Israeli occupation and it's exactly to turn the pyramid upside down again, and I mean to use the propaganda to turn the question [upside down]. The question is not about the Israeli soldiers' violence. You don't have to heal the children in Jenin. We didn't try to heal their violence. We tried to challenge it into more productive ways. And more productive ways are not an alternative to resistance. What we were doing in the theatre is not trying to be a replacement or an alternative to the resistance of the Palestinians in the struggle for liberation. Just the opposite. This must be clear. I know it's not good for fundraising, because I'm not a social worker, I'm not a good Jew going to help the Arabs, and I'm not a philanthropic Palestinian who comes to feed the poor. We are joining, by all means, the struggle for liberation of the Palestinian people, which is our liberation struggle. Everybody who is connected to this project says that he feels that he is also occupied by the Zionist movement, by the military regime of Israel, and by its policy. Either he lives in Jenin, or in Haifa, or in Tel Aviv. Nobody joined this project to heal. We're not healers. We're not good Christians. We are freedom fighters. JMK: Yeah, the screenings of it. It was sold, but not broadcast and also in Israel in many places. I don't know, this is for you to judge, but I believe that people will try to boycott or create difficulties to screen this film. Of course, that's why we're pushing it so hard, trying to do it by ourselves. But just to clarify the theatre [question], joining the Palestinian intifada, by our definition: we believe that the strongest struggle today should be cultural, moral. This must be clear. We are not teaching the boys and the girls how to use arms or how to create explosives, but we expose them to discourse of liberation, of liberty. We expose them to art, culture, music -- which I believe can create better people for the future, and I hope that some of them, some of our friends in Jenin, will lead ... and continue the resistance against the occupation through this project, through this theatre. MMG: Israeli director Yehuda "Judd" Ne'eman says he came to filmmaking "through the slaughterhouse of modern warfare." He says he was disillusioned by art in the face of war atrocities, but, I'm quoting, "When the situation in my country deteriorates politically, when my body deteriorates physically, it's high time to believe in art." Is that different or similar to your own mission across political and artistic fault lines? JMK: The same aspects and same starting points apply for me. Art, in our case, can combine and generate and mobilize other aspects of resistance. All I care about is resistance. I'm not doing art for the sake of art. I don't believe in art for the sake of art. I think art can generate and motivate and combine and create a universal, liberated discourse. This is my concern about art. On the other side there is the therapeutic level, and the therapeutic level is not to heal. This is very important if you can point it out -- it's not to heal anybody from his violence. It's to create an awareness they can use in the right way. Not against themselves. MMG: You served in the Israeli army but quit after you were asked to stop your father's Palestinian relatives at a military checkpoint. How significant was that event as a turning point in your political and even artistic formation? JMK: It was the straw that broke the camel's back. But I was boiling since I tried to disguise myself. The outfit could not fit, you see? I could not fit the outfit. And it blew up in my face that certain day in the checkpoint, but I was boiling for years. JMK: I served for one and a half years, but in a very intensive special forces unit [the Paratroopers Brigade]. I don't regret it, I must be honest. First of all, from the practical side, it saved my life many times during this theatre-making and the film. I know all aspects of the Israeli army, I speak Hebrew, I know the language, I know how to deal with them. It's like combat training for life. And on the other hand, I penetrated the deepest sources of the Israeli propaganda, the smallest cells of Israeli society, which is fertilized in the army. The army in Israel is the essence of life, the army in Israel is the discourse of life, the army in Israeli is the foundation of the society. Once you penetrate this and you understand the dynamics, you can oppose and create and use it for yourself. Maryam Monalisa Gharavi has contributed poetry and critical writing to various publications. Her films have been screened at Townhouse Gallery of Contemporary Art, Harvard Film Archive, Pacific Film Archive and elsewhere. She is a doctoral candidate in Comparative Literature and Film and Visual Studies at Harvard University. Through his life and his body, Juliano Mer-Khamis embodied the possibility of a binational resistance movement. By Amira Hass Haaretz April 6, 2011. Those who knew Juliano Mer-Khamis, the Nazareth-born actor and director who was shot in Jenin on Monday, will have to be the ones to write about him; all that the rest of us can do is write about the milestones in his life. Juliano was lucky. He was born Palestinian and Jewish, Jewish and Palestinian. This angry man was beset by conflicting yet complementary identities. He was the long shadow of an imagined binational community from the 1950s. Like a Peter Pan who refuses to grow up, Juliano embodied the potential of a shared life (ta'ayush in Arabic ) while striving for equality. The son of a Jewish mother and a Palestinian father, he was born to two cultures, and chose to live in both. He saw no need to explain. My guess is that Juliano wasn't entertaining illusions; sustaining blows from all sides, the potential of ta'ayush shrank. Ta'ayush is the sane vision, but the chance that it will be realized is increasingly slim. There are some who fantasize about the days of the Messiah to avoid thinking about the days before the next disaster strikes. Juliano's was the offspring of a fantasy of ta'ayush. His birth was the outcome of a fantasy of ta'ayush, and his death is a disaster. Juliano was angry. His rage was the kind that only a Jew like him, who was born on the left and craved equality until the end, can allow himself to express as a way of life. Palestinians must conquer the anger, mellow it; they must tame it, repress it, sublimate it. That's the only way to stay both alive and sane (without getting arrested, wounded or killed ) under the conditions of physical and non-physical violence dictated by Israel. Oy, this coarse violence, which reeks of rationalism and supremacy and pretends to be enlightened. It is found in every detail of life, moment by moment, from cradle to grave. It is found from a expropriation order and an accompanying map to the firing hole of a watchtower; from the Interior Ministry expelling Palestinian Jerusalemites from their home town to the blocking of return to the Galilee village of Bir'im; from the racist responses of Jewish youth in opinion polls to the drone that homed in on children playing on the roof in Gaza. The violence is always there, from the Jerusalem municipal taxes despite the ruined roads and uncollected garbage to the security cameras in the Jewish neighborhood/Crusader shtetl in Silwan; from the lush green of a settlement to the Palestinian cistern destroyed by an Israeli bulldozer; from the permits granted to individual ranches in the Negev to the incrimination of Bedouin as "infiltrators." In short, from the Jewish to the democratic. This violence has so many different angles that it can drive you mad. Juliano was lucky to be an artist, and madness was one of his paintbrushes. Through the theater he founded in Jenin, Juliano allowed himself to criticize repressive aspects of Palestinian society. One would guess he did so as a left-winger, as an actor committed to the artist's oath of truthfulness, and as a Palestinian. Let's hope that the killer will be found, and then we'll know if a Palestinian artist was killed because of his courage to live in a way that disrupts the order, or if a Jewish artist was killed because he gave himself permission to overtly criticize a society that is not his, according to some, or if a left-winger was killed because he was disrupting the norm. Or perhaps all three together. Even if he was killed for some other reason, Juliano was still an artist and a Palestinian, a left-winger and a Jew. Now that the prospect of the sane vision of ta'ayush is small, what is left? The path. This is the option of a binational resistance movement, which wants to topple the Gadhafi-like, Mubarak-like, Assad-like rule of one people over another. There are some who insist on fantasizing about a binational movement as a historic necessity, as a logical antithesis to the ideology of the demographic separation that has become the bible of the Oslo process. The truth must be said: In the meantime, most of those who harbor such a fantasy are Jewish. Thus do we soften the contradiction between love for the people and the place on the one hand and the abhorrence of the enlightened violence on the other. 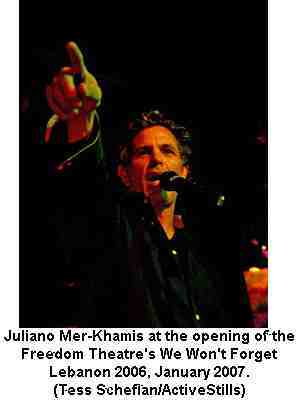 Through his life and his body, Juliano Mer-Khamis embodied the possibility of a binational resistance movement. The killer, whatever his motive, was aiming for the body. In his death, Juliano has bequeathed us the possible. Among the old photographs which I kept from all sorts of demonstrations I saw on the wall opposite the computer where I am now writing one which is a bit faded but still very noticeable. It shows Juliano Mer-Khamish and his late mother Arna at a demonstration held in the Lower Town of Haifa. The photographer captured both of them at a moment of a very intense crying out. Juliano is quite young on this photograph, no yet having grown the beard which characterized him in later years. I think I remember this particular demonstration, the chanting and protest and anger, but I can't remember which was the particular act of grave injustice against which we were protesting on that day, and which impelled Giuliano to wear a Yellow Star on his breast and engage in angry shouting confrontations with passers-by. There were years when a demonstration against the Occupation was incomplete without having Juliano Mer among its participants and organizers. In recent years he was hardly seen in demonstrations any more. He gave himself totally to the Freedom Theatre which he founded and directed at the Jenin Refugee Camp, the idea that Palestinians can fight against the occupation from the stage of the theater. Not a few Palestinians were drawn in, including some who before only believed in the gun. Did he come there as an Israeli Jew from his mother's side, who came to express solidarity with the oppressed and occupied? (In fact,.it was Arna who first started going to the Jenin Refugee Camp, starting there a kindergarten in the midst of the First Intifada, for which she later got the Alternative Nobel Prize? Or did he come as a Palestinian from his father's side, a Palestinian with relatively comfortable circumstances who came to help the more blatantly oppressed members of his people? "Both and neither, first and foremost he was a human being," an activist from Haifa who knew him well told me. Someone, somewhere found the activity of Juliano Mer-Khamish at the Jenin Refugee Camp to be very disturbing. Disturbing enough to send masked assassins to shoot him down. Juliano's marked personality and outspoken message certainly created for him enemies left and right. His co-workers, the young Palestinian actors , the friends of the Freedom Theater of Jenin Refugee Camp will have to carry on without him, strenghtened by the enormous outrage at the terrible news. Also among the Israeli actors Juliano was respected and beloved. TG, why doesn't his murder and other non-violent activists by Palestinians makes You reconsider your views ? If civillian leadership is murdered who is suppose to democratically represent them ? Where opposition is acceptable in Israel, and to some extent, even in the PA.
Why do you think Fayad's "Palestinian Zionism" wouldn't work ? Constructive ideas made Israel viable, and his plans seem quite constructive, not supportive of terror, and encourage domestic economical growth. any decline in the occupation cannot create an empty space - there should be a democratic Palestinian power to take control of it, and no one other than he, has anything to offer in that aspect. your blindness towards the murders of Mer and other activists, is giving the impunity. Firstly I don't know who actually murdered Juliano. Israel has long taken out the civilian leadership of the resistance, so I would expect its bloody fingerprints would have been in evidence. Actually Hamas isn't extreme Islam as the murder of the Italian activist yesterday demonstrates. It suits Israel, which helped create Hamas, to portray it as such. What you call Palestinian Zionism is in fact collaboration. Just as the leadership the Nazis imposed on the Jewish ghettos, the Judenrat and Jewish Police, were collaborators. No not constructive ideas made Israel viable, as you call it, but the normal barbarism of colonialism which evicted the indigenous population to make way for the settlers. The PA which you clearly support, as a Zionist, is worthy of your support. However its record of torture of its opponents and their 'disappearance' proves otherwise.